Even though the reflection of medical profession has now been captured within the focus of business, yet medical profession is regarded as one of the noblest professions. Medicine is regarded as a science with probabilities and possibilities; the role of medical professionals in determining the probabilities is significantly high. To ensure that a proper standard is maintained by the medical professionals, we have a number of regulatory agencies like the Medical Council of India, the Dental Council including the children division of Kids Happy Teeth, the Nursing Council, the Pharmacy Council etc. Hence, the scope of medical professionals is not limited to doctors alone. The code of medical ethics notified by the Medical Council of India, specifically provides for the duties and obligations of doctors, significant among them being the duties of physicians to the patients. Tortuous liability arising out of negligence. The criminal liability of the medical professionals in case of negligence is in accordance with S. 304A of the Indian Penal Code. By virtue of this section, a complaint can be registered against a medical practitioner for alleged criminal professional negligence. This section however has equalized the charge against an erring driver in a road traffic accident for causing the death of a person by negligent and rash driving. The practices of medicine that fall within the purview of S. 304A may include, negligent performance of diagnostic or treatment that led to death, reckless administration of anaesthetia, negligent use of life saving devices etc. The decision of the Supreme Court ordering to pay a significant sum of money as damages for the death of the plaintiff’s wife that aroused out of the medical negligence of the hospital is in no doubt a new pathway of hope. It has also now become a trend to drag medical professionals to unwanted litigation. The need to prevent the medical practitioners from being put to unnecessary harassment was discussed in Dr. Suresh Gupta v. Govt. of NCT Delhi. Thus, the simple lack of care, error of judgment or an accident is not enough to prove negligence and that failure to use special or extra ordinary precautions that might have prevented an injury cannot be set as the standard for judging medical negligence. Section 336, IPC– Whoever does any act so rashly or negligently as to endanger human life or the personal safety others, shall be punished with imprisonment of either description for a term which may extend to three months or with fine which may extend to two hundred and fifty rupees, or with both. Section 337, IPC- Causing hurt by act endangering life or personal safety of others. Section 338, IPC- Causing grievous hurt by act endangering life or personal safety of others. Thus a doctor cannot be held criminally responsible for a patient’s death unless it is shown that she/ he was negligent or incompetent, with such disregard for the life and safety of his patient that it amounted to a crime against the State. Sections 80 and 88 of the Indian Penal Code contain defences for doctors accused of criminal liability. Section 88, IPC- Act not intended to cause death, done by consent in good faith for person’s benefit. Section 80, IPC- Accident in doing a lawful act. Section 174 Cr.P.C empowers the police on enquiry and investigation into suicide etc. It can also include deaths arising out of investigative and therapeutic procedures by qualified medical practitioners. The general law is that the medical professionals are liable for their services individually as well as vicariously. The decision of the Supreme Court in Indian Medical Association v. VP Shantha gives an elaborate view on the civil liability that exists in case of medical practitioners. The accused professional must have committed an act of omission or commission; this act must have been in breach of the person’s duty; and this must have caused harm to the injured person. It is the obligation of the complainant to prove the allegation against the doctor by citing the best evidence available in medical jurisprudence and by presenting expert scientific opinion along with other evidences. In some situations, the complainant can invoke the principle of res ispa loquitur. 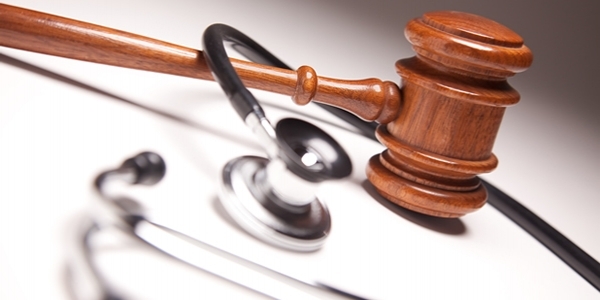 The launch of proceedings before the civil courts under the medical negligence laws in India starts with the filing of the suit before the civil court which can either be for claiming compensation from the medical practitioner for the loss sustained or for claiming any other relief related to the alleged act. The proceedings before the civil court are decided by filing of the written statement by the medical practitioner and after the leading of the evidence before court during which the court can summon the evidence of the experts for deciding the said matters. The final outcome of the proceedings before the civil court is by way of a decree which is passed by the court based on the facts of the case and after considering the entire evidence in the matter. There are a number of decisions ranging from Spring Meadows Hospital Case that establishes a standard proof for determining the liability of medical practitioners under the Consumer Protection Act, 1986. Medical negligence comes within the purview of Deficiency in Service as contemplated in the Consumer Protection Act, 1986. According to the Delhi State Consumer Commission, in Kalyani Dutta v. Thirath Ram Hospital, not providing blood to a patient, who could die if blood transfusion is delayed amounts to deficiency in service. Doctor – patient relationship is regarded as one of the most inimitable and privileged relationships based on faith and mutual confidence. The increasing commercialization of modern medical practice has affected the fate of medical fraternity. Even though we have strong legislations to check professional negligence, yet the instances of professional misconduct and negligence are increasing day by day. It is not the number of statutes but the strength of them being implemented that matters. The regulatory agencies should ensure that the requisite standard is being met by the medical professionals and the Government should do the necessary for ensuring the same. Thus a hybrid of command and control & self regulatory strategy should be followed by the Government. Decision in Anuradha Saha case. Let the thing speak for itself.